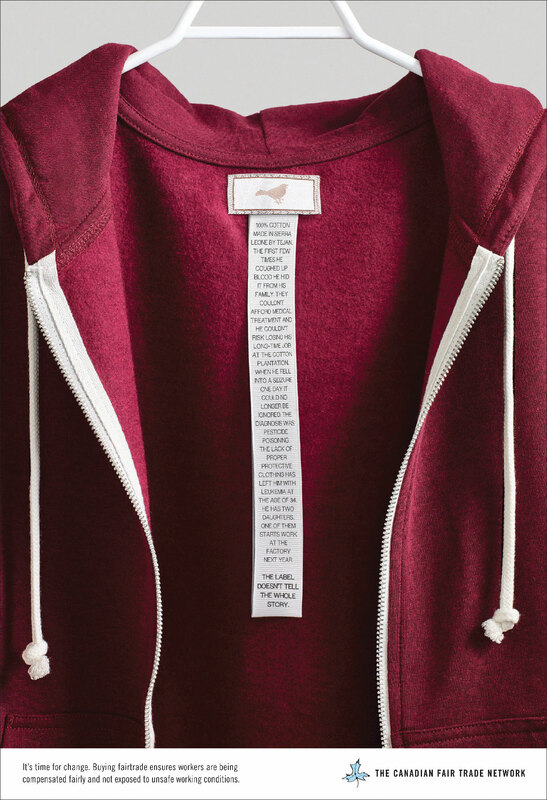 The label on a piece of clothing might reveal something about its provenance, but it hardly tells the whole story. The Canadian Fair Trade Network wanted to change that. 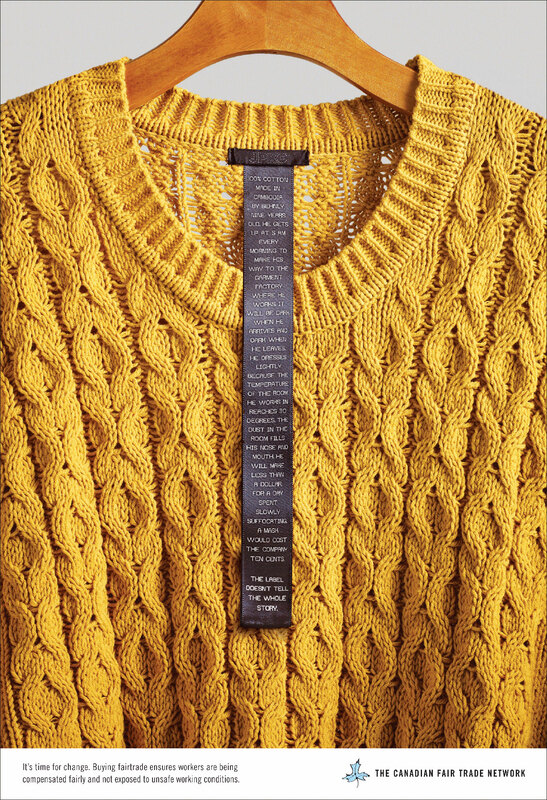 To draw attention to people around the world who are working in unsafe conditions, these remarkable ads tell their stories on the labels of clothes they make. 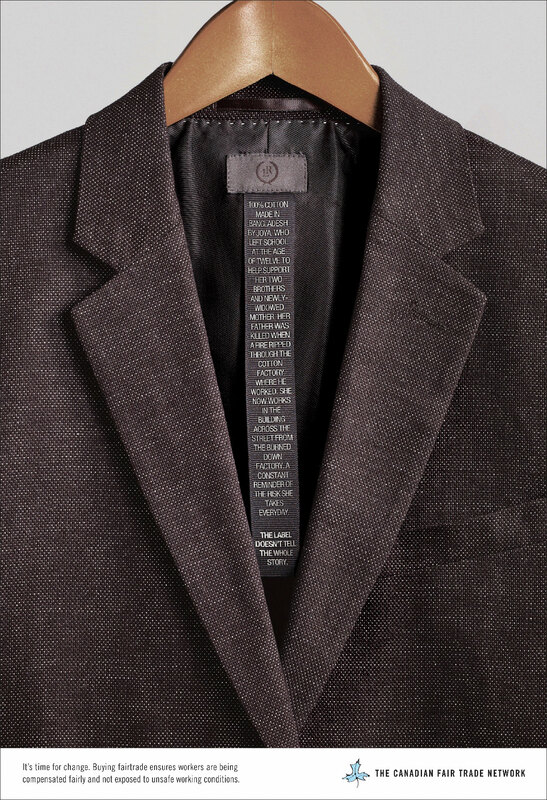 Powerful work by agency Rethink. 100% cotton. Made in Sierra Leone by Tejan. The first few times he coughed up blood he hid it from his family. They couldn't afford medical treatment and he couldn't risk losing his long-time job at the cotton plantation. When he fell into a seizure one day it could no longer be ignored. The diagnosis was pesticide poisoning. The lack of proper protective clothing has left him with leukemia at the age of 34. He has two daughters. One of them starts work at the factory next year. The label doesn't tell the whole story. 100% cotton. Made in Bangladesh by Joya who left school at the age of twelve to help support her two brothers and newly widowed mother. Her father was killed when a fire ripped through the cotton factory where he works. She now works in the building across the street from the burned down factory. A constant reminder of the risk she takes everyday. The label doesn't tell the whole story. 100% cotton. Made in Cambodia by Behnly, nine years old. He gets up at 5:00 am every morning to make his way to the garment factory where he works. It will be dark when he arrives and dark when he leaves. He dresses lightly because the temperature in the room he works reaches 30 degrees. The dust in the room fills his nose and mouth. He will make less than a dollar, for a day spent slowly suffocating. A mask would cost the company ten cents. The label doesn't tell the whole story.